OfficeXpats is selected as a 2017 Edg3 Fund semifinalist! UPDATE: The voting window is open! Please VOTE HERE and help us advance to the finals. Thank you, and please share. Only one company from Bainbridge Island is represented among 16 semi-finalists just announced for Kitsap Bank’s Edg3 Fund small business competition. OfficeXpats is now a big step closer to the $20,000 grand prize. The push to make it to the finals starts on September 18, when pubic voting will narrow the field to just five companies. The Edg3 fund competition, now in its 4th year, awards the grand prize to a Puget Sound company that best fits its mission of economic, social, and environmental contributions to the community, and can show how $20,000 would give that company an “edge.” OfficeXpats—a coworking hub and meeting room rental business on the second floor of the Bainbridge Pavilion—brings together many remote workers, “solopreneurs,” and small businesses. OfficeXpats provides productivity essentials such as desk space, fast wi-fi, printers/scanners/copiers, and gourmet coffee, while creating a nourishing environment for the real prize: the relationships that grow between independent professionals to form an interconnected community. 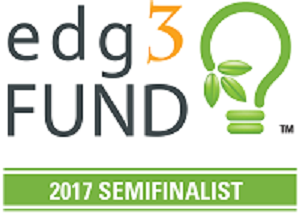 "We are thrilled to have been chosen as a semi-finalist for the Edg3 fund competition," said OfficeXpats co-founder Leslie Schneider. "It acknowledges the tangible value our business provides to the Bainbridge Island community. In many cases OfficeXpats is a launch pad for businesses that move on to form larger companies, and winning the award would help us expand and offer more options to people who want to grow their business and work on the island." A major component of the Edg3 competition entry is a short “pitch” video. This two-minutes-or-less film is a company’s best way to win hearts and minds in the second phase of the contest—the public vote. OfficeXpats founders Jason Omens and Leslie Schneider approached a member, Laurance Price of Priceless Productions, to shoot their video. It features members discussing the economic and community benefits they experience working in this shared office. The video is narrated by Charlie King, a long-time member and professional coach who developed podcasting skills using OfficeXpats as his “studio.” The video can be found on YouTube in a search for Edg3 Fund 2017, or on the OfficeXpats channel, or directly from this link: https://youtu.be/o1F1rIeiPhg. OfficeXpats will be mobilizing networks on Bainbridge and beyond starting September 18 to get online votes and advance to the finals. In a live event November 16, five finalists make their pitches and a panel of independent judges award the $20,000.